Imagine a cold, dank winter’s day, there is a sad, little procession winding it’s way up Dartmeet Hill, they are carrying a shrouded corpse. The sound of mournful singing can be heard echoing across the misty moor, every now and again the dirge is interrupted by desperate weeping and wailing. Despite having had a recent rest at the Coffin Stone the mourners are struggling to find enough breath to sing and walk up the steep incline. Having finally crested the hilltop the sombre party now make towards a lone, granite cross which stands reassuringly before them. Telepathically the stone pillar tells them that they are on God’s Path and their departed brother has nearly completed his final journey into his saviour’s bosom. The party stop beside the cold, granite cross and with their heads bowed they say a prayer for the departed soul. One or two of the older folk secretly say prayer for the strength to complete the final three and a half arduous miles that lay before them. Slowly the procession continued forth towards Widecombe-in-the-Moor, as it did so a frail old woman bedecked in a black shawl briefly stopped and glanced back at the old cross. The granite pillar of witness knew that it wouldn’t be many months before her corpse would be stopping under its gaze. Today this wayside cross is marked on the Ordnance Survey map as standing near Ollsbrim, locally this small homestead is known as Ouldsbroom and the cross likewise is recognised as Ouldsbroom Cross. Sadly, its appearance reflects the mistreatment it has received at the hand of man in recent times. Today the old cross can barely stretch to a height of 1.57 metres with a circumference of 1.46 metres. The span of the amputated arms reaches a mere 46 centimetres, between and just below centre is evidence of a gate hanger, (Sandles, 1997, p.76). William Crossing wrote that in 1902 that he saw the old cross serving as a gate post at Town Farm in Leusdon and that he had been told it had been there since 1825. It appears that the then farmer, Thomas Hext, had dragged the cross to his farm on a ‘slide’ (sledge) which was drawn by four oxen. This would have involved a journey of about 2 miles which seems a lot of trouble just to get a gate post. Once on the farm the ancient waymarker then had one arm knocked off and the other virtually chiselled away leaving a stumpy pillar. Crossing also notes the following; ‘we soon reach a point known as Ouldsbroom Cross, where a road branches to Ashburton. The old stone that formerly marked it, and which has given to the place its name...’ , (Crossing, 1987, p.171). The earliest documentary evidence for Ouldsbroom comes from the Patent Rolls of 1317 when it is listed as Oldesbrom. This is thought to be a personal place-name with the first element ‘Olde‘ representing a person and the second element ‘brom‘ meaning ‘broom covered land’. Hence we have ‘the broom covered land belonging to Olde’, (Gover et al., 1998, p.528). Therefore, if the cross took its name from the place of Ouldsbroom and the earliest record of there was 1317, the cross must have been erected some time after that date. Crossing (1990, p. 460) mentions there being some early documented evidence of a certain, ‘John of Ollesbrom’ which dates back to the fourteenth century, sadly he does not mention his source. Again this would substantiate the date of 1317 as suggested by Gover and also give a Christian name for Mr. Olde. From these early dates there is little reference to the cross until we reach the early 19th century. Following the construction of Dartmoor Prison in 1809 it was used to house French prisoners of the Napoleonic Wars. Unlike ordinary service members the officers were allowed to be billeted at some of the Dartmoor towns. This privilege was extended on condition that they did not break the terms of their parole, one of which was not to go further than one mile form the outskirts of their place of billet. These limits were marked by various boundary points such as existing boundstones, trees (see – The Honour Oak) and in the case of Ollsbrim, the cross. Therefore in the early nineteenth century Ollsbrim cross served as a parole stone for the limits of Princetown which meant it was standing at that time, (Brewer, pp. 257 – 259). However, this is not the end of the story and to get the rest we must go back to medieval times. The church at Widecombe has over the centuries earnt itself the title of ‘Cathedral of the Moor’. The earliest documentary evidence of the church’s existence is a document which lists the various rectors, in this an unknown rector is recorded as being here in 1253. In 1258 the same document records that Master Thomas de Bokelande was the incumbent, (Woods, 1996, p.49). The actual dedication of the church took place in 1223 when Orme (1996, p.217) notes the following, ‘Henry persona Sancti Pancrassi’. The ancient tenements and farmsteads in the area of the central West Dart river were Prince Hall, Dunnabridge, Sherberton, Brownberry, Hexworthy, Huccaby and Brimpts. The earliest of these settlements was Huccaby whose earliest documented record was in the Patent Rolls of 1317, (Gover et al. p. 194). The latest recorded habitation was that of Brownberry which appears in a Duchy record of 1563, (Gover et al. p.198). All of these places would have had to use a church for such things as receiving of the sacraments, christenings, marriages, burials and paying their tithes. That means they would need a church and the nearest one was that of Widecombe. Therefore if they needed to attend the church they required a route to get there and in this case it would have been the Widecombe Church Path. once having crossed the East Dart river this trackway led up to the Coffin Stone and up over Dartmeet Hill to Ouldsbroom Cross. So, now trying to tie all of this together, it is known that the habitation of Oldesbrom was in existence in 1317 and that the earliest settlement west of here was Huccaby that was also established in 1317. The church at Widecombe was in use from at least 1253 and people needed to get to it. 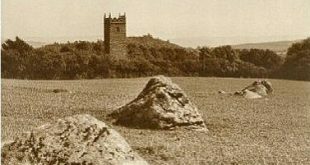 So there is a strong possibility that if the cross took its name from the dwelling of Oldesbrom then that cross marked the Church Path to Widecombe from its inception. Just past the cross the Church Path winds it way above the enclosure of Ollsbrim and skirts along the edge of Corndon Down. After this it hugs the southern enclosure walls of Foxworthy as can be seen in the map above. In some cases this can be interpreted as indicating that a trackway existed prior to the building of the enclosure walls. This theory is based on the idea that if any track or road was insitu prior to enclosure it would be pointless to build a wall than then closed it off, therefore any walls would be erected adjacent to the route. The Church Path then joins an intersection of routes at a junction called Lock’s Gate Cross which today hides an interesting past. It is thought that this crossroads was where either a criminal or suicide who went by the name of Lock was buried. A short distance down the road is a small plot of wasteland adjacent to Uphill farm called Quintin’s Close which is thought to have originally been called Quintin’s Graveyard. A theory persists that the name ‘Quintin’ is another name for the Devil and this plot of land is also the site of a suicide’s burial, (French, 1963, p. 165). I cannot at the moment find the reference but I have read in the past that also near here was the site of the gallows used by the manor of Spitchwick. It’s therefore surprising that with suicides’ graves, convicts graves, some gallows and an ancient track along which the dead were carried there are no associated tales of terror. French, H. 1963. Field Names in Widecombe-in-the-Moor. Transactions of the Devonshire Association, Volume 95. Orme, N. 1996. English Church Dedications with a Survey of Devon and Cornwall. Exeter: Exeter University Press. Wood, S. H. 1996. Widecombe-in-the-Moor. Tiverton: Devon Books.